This just popped into my inbox while I was on a break…who would have though that a couple of years ago, Hawkeye was two guys in an tiny back office between an accountant and a dentist? 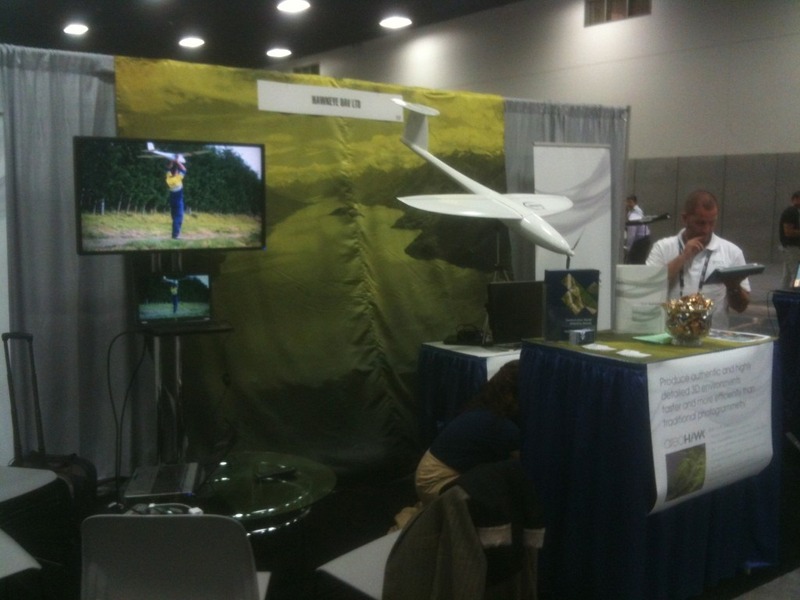 Hawkeye UAV was fortunate enough to be invited to exhibit at this year’s ESRI GIS User Conference in San Diego. With a sponsored booth in a prime position in Hall D we could only say “Yes, thank you!” So in late July, Rowland and myself made our way across from New Zealand. Rowland left the week prior to the UC in order to attend the preconference seminars, conduct some meetings and make our technology accessible to the Survey community. Along with the two of us, and providing their expertise on the photogrammetry processing were Luke, Hayden and Sheryl from Areo. The first big coup was ESRI’s invitation to have our display bird on the main stage for the duration of the weekend and Plenary sessions at the start of the Conference. To put all this in perspective, the “main stage” is in front of a room in the region of 200m long, and is backed by three HUGE screens. The room hosted 16,000 people at one time, so a lot of GIS professionals saw our UAV onstage and some of our data as part of the plenary presentations. In fact many folks mentioned to us at the booth that they’d seen the AreoHawk onstage and asked about the content in the keynote presentation. 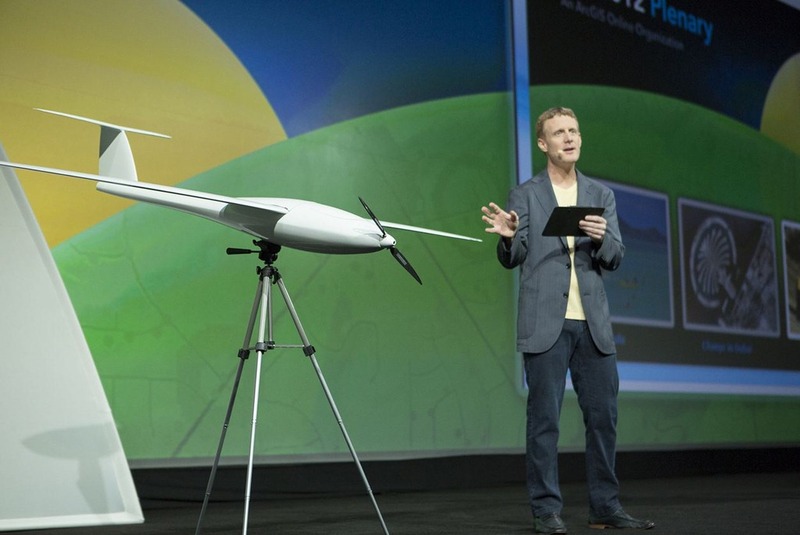 It was both humbling an exciting to have our technology out there in front of the world. 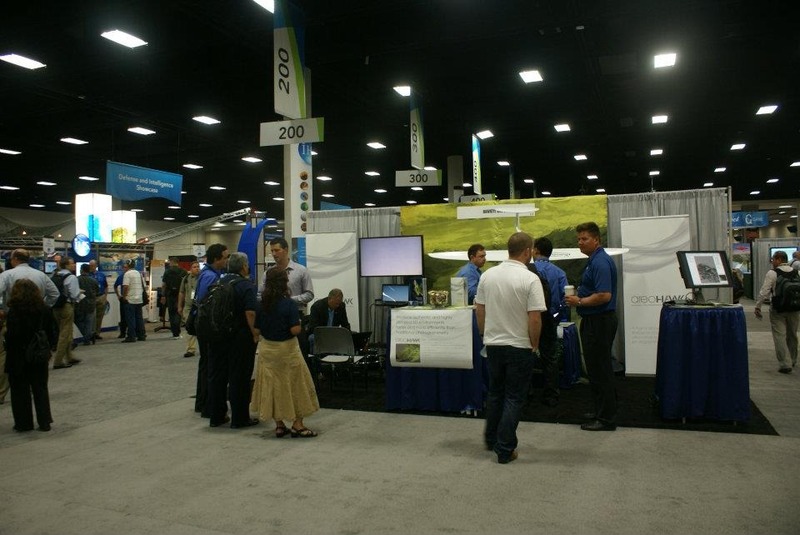 Supporting us this year at our first time attending the ESRI UC were Hawkeye UAV Americas (HUA) – our North American partners from Tactical Systems Engineering. They were represented by Drew Gwyer, Dave Molthen and Ermie, and were brilliant in helping man the booth, collecting information and assisting people with their inquiries. 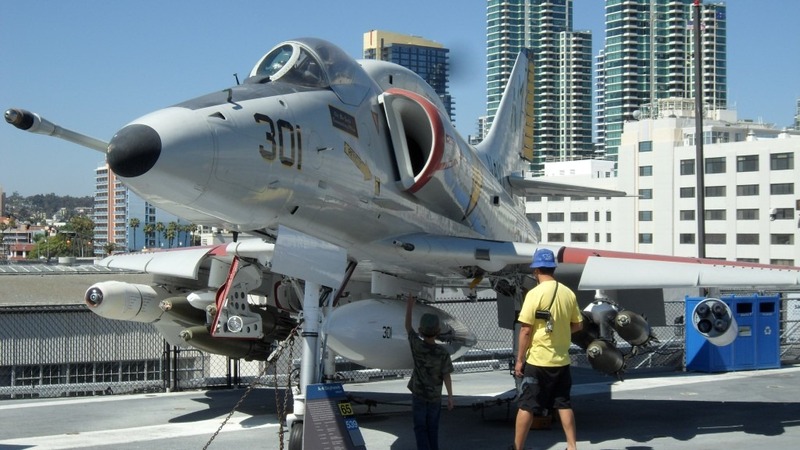 Their local knowledge of San Diego was of great benefit also! Check out these guys’ website some very cool and innovative kit there – I really want to get my mitts on WINGMAN and DACTYL to have a play with – possibly why they’re part of HUA (is that a take off ‘Hoo-aahh!’?)…. 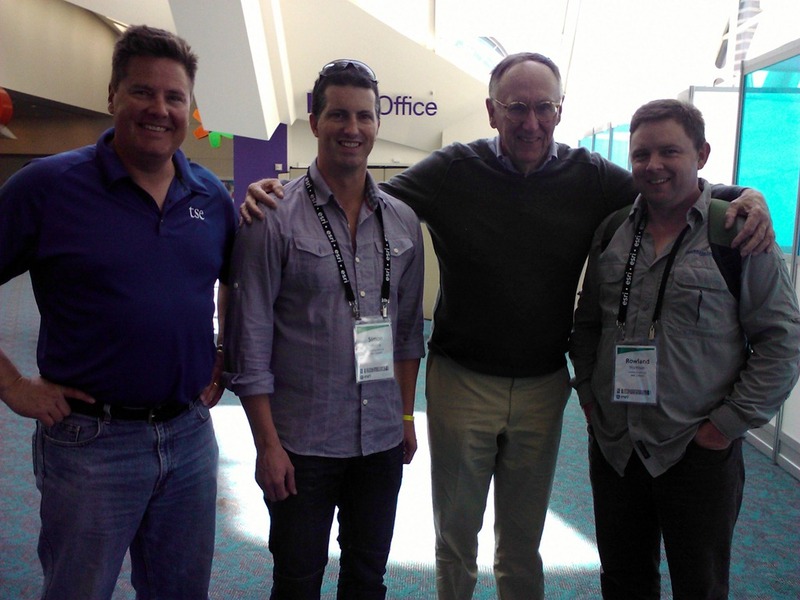 Special mention must also be made of Mark Deuter, Director of Aerometrex our distributor in Australia. He zoomed in from Australia to lend his vast expertise of all things aerial photography and provide a bit of Aussie contrast to the strong Kiwi flavour on the booth. Monday before the conference start was our day to set up the booth before the Exhibitor Expo got underway Tuesday. Tuesday started with a hiss and a roar – when we were allowed into the exhibition hall at 8am to do our final setup and start the demos rolling, we only just got in before the influx of people started. It was soon apparent that we hadn’t printed nearly enough flyers to keep up with demand! If you were one of those who missed out, I’m very sorry. But we did get some more done to see us out until the end of the UC. The candy ran out before the end of day one too! The conference has been a huge success for us. We have literally been hand-launched (rather than catapulted) onto the World’s stage. Interest from all over the globe and the United States has been tremendous and very encouraging. HUA/TSE share our ethos and vision for leading the precision survey Unmanned Aerial System market. It is also apparent to us that we not only have a world class system that’s been developed here in New Zealand, but the AreoGraph process is second to none. We now expect our tempo to rise, and our global footprint to reach wider and further than before. A large number of confirmed sales and survey jobs have already come from the ESRI UC and we expect more to follow as soon as demonstrations and follow ups can be arranged. Simply put, to fly UAS’s in the United States today you must either be a Government, Federal or State agency or a ‘not for profit’ organisation, such as a University. Federal Aviation Administration regulations currently require these parties to obtain a Certificate of Authorization (COA) before flight. In conjunction with HUA/TSE we are actively working with FAA representatives to achieve an accreditation for the licensed commercial flight of the AreoHawk system within the United States. We currently hold such accreditation in New Zealand with the Civil Aviation Authority (CAA) and are also underway with CASA (Civil Aviation Safety Authority) registration for Australia. We strongly believe our unblemished record will stand us in good stead in this regard. It has always been our intention, especially as aviators ourselves, to comply with and exceed the expectations of the governing body where these matters are concerned. Hence our emphasis on safety, failsafe systems, compliance and training. We have found now that with the new and vastly improved AreoHawk processing software that we can re-process old jobs and archived imagery with great success. Second time around the quality of the orthos and the density of the point clouds are an amazing contrast. 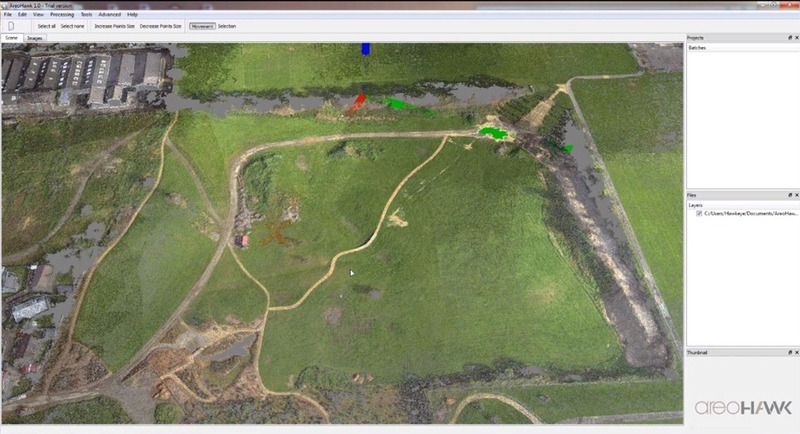 This entry was posted in Playing with Toys and tagged aviation, New Zealand, Unmanned Aerial Systems by SJPONeill. Bookmark the permalink.